Reviews are very important to an author. 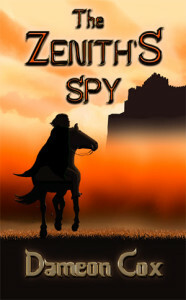 I’ll send you a free PDF of my novel, THE ZENITH’S SPY to read. For this, I ask you to write a review on Amazon for the novel. I won’t send more than two emails a month and those will be to let you know what’s happening with me and my upcoming projects. My goal is to produce two novels a year. I hope to receive honest reviews that’ll allow me to improve my work. A one or two star review is normally given for a novel that has many misspelled words, poor grammar throughout and several plot flaws. My novels have received Five Star reviews from Amazon’s own reviewers. Does that mean you must give me three to five stars: NO! Nonetheless, your sincere opinions will be most appreciated! GET THE ZENITH'S SPY - FREE! Zack Stand, the Zenith Lord's spy has faced murderers, bandits, torture, the intrigues of the High Lords and worse. Now, an ancient evil the first Zenith Lord defeated two millennia ago grows once more. Reports of a malevolent power emanating from a subcontinent far from the Seven Realms causes concern. Zack is sent to discover the truth. What he finds is unimaginable horror. To read the first chapter of a book in my Zenith Series click on a book below.